Just east of the city center, the Laugardalur neighborhood boasts a number of scenic paths which are popular among runners. It’s easy to start from anywhere in the neighborhood and create your own route, but our map starts out at the Laugardalslaug Station on the north end of Laugardalur. From there, you can head south towards the Laugardalur national football stadium. Round the stadium and turn LEFT towards the Laugardalur washing pools. Pass the ice rink on your right, and you’ll reach the northern limits of the Húsdýragarðurinn (Zoo). Turn RIGHT on the path along Engjavegur. At Fjölskyldugarðurinn Park, turn LEFT to run between the park and zoo. 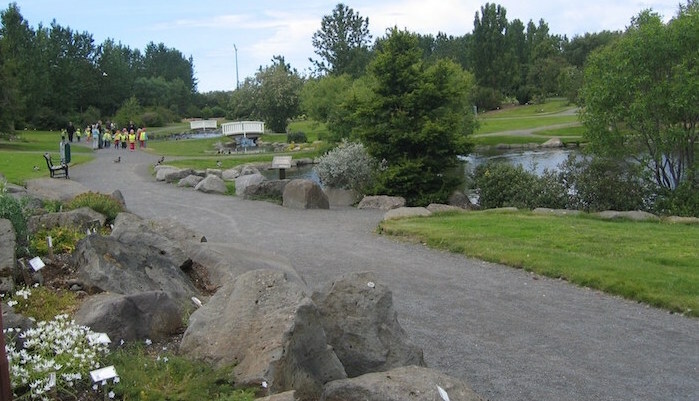 Another path will take you north past the beautiful Grasagarður Botanical Gardens and the Reykjavik Campground. Turn LEFT at the end of the campground to head back towards the beginning of the route.